In the heart of the ultra cool Venice Beach lie many new restaurants and boutique stores. Abbott Kinney Bvd is home to many of those and has recently been called the coolest street in America. 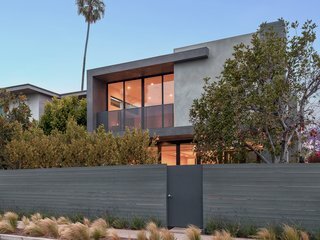 Nestled into the prestigious Presidents Row, a quiet residential neighborhood just a few blocks away from Abbott Kinney lies the meticulous home designed by Wylan/James Development. Clean, crisp lines, smooth transitions with floor to ceiling and wall to wall bi-fold doors allow a rare indoor/outdoor architectural experience. Neutral tones and large volume spaces create a one of a kind open space. The kitchen is a modern masterpiece with a double-height ceiling, designer matte Corian countertops, Miele and Sub-Zero appliances, Hansgrohe finishes and an enormous center island with bar seating and built-in wine fridge. An outdoor courtyard with fire-pit creates a comfortable lounge area directly off the kitchen and dining room. Gracing the second level you'll find two ensuite bedrooms, in addition to the master wing complete with a generous walk-in closet secluded balcony and elegant bathroom. Upstairs flooring by Porcelenosa. Crowning the home is a 760 sq. ft. entertaining rooftop deck boasting 360 degree views. uploaded Wylan/James Residence through Add A Home. Custom linen cabinets grace the open concept kitchen. Miele range and wall oven. Custom light fixture by Edge Lighting NYC. Custom matte Corian countertops finish the large center island. Custom pocket doors open throughout the entire ground floor to create a one of a kind indoor/outdoor space throughout. Master bathroom with palm tree lined ocean views. Custom Sinks by Furgeson, Flooring by Porcelenosa. Grey stucco and stained wood siding grace the exterior elements of the home along with custom black framed windows and bi-fold doors.